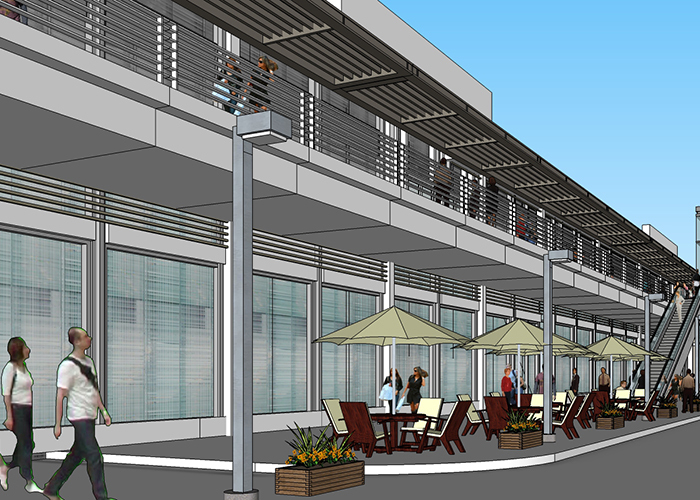 The plan to transform University Mall on Fowler Avenue into a research village is beginning to take shape with a new lease agreement to house USF’s Institute of Applied Engineering. The Institute will move into a fledgling tech hub that already attracts networking events and community gatherings to a central portion of the mall as vacant department stores are now being converted into office, retail, and entertainment space. The transformation of the area surrounding the mall into what’s now being called the Uptown District has been slowly unfolding for almost a decade. This renovation project to spur development and end blight in the long-neglected surrounding neighborhoods is being led by !p (better known as the Tampa Innovation Alliance) and largely funded by public-private partnerships, including government funding, and resources from the University of South Florida, Moffitt Cancer Center, the James A. Haley Veterans’ Hospital, Busch Gardens, and AdventHealth Tampa. The Uptown District covers 19 square miles bordered by Bearss Avenue to the north, Busch Boulevard to the south and Interstates 75 and 275 to the east and west. 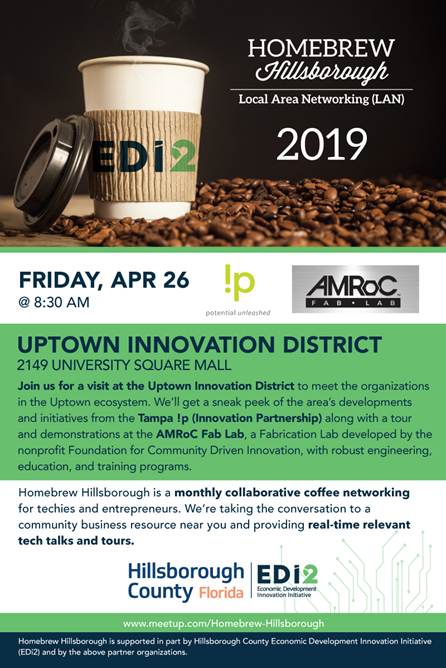 And while there are many components to the sprawling innovation district, !p Executive Director Mark Sharpe says the nexus of the entire region is the property occupied by University Mall, which sits on Fowler Avenue near 22nd Street. In February 2019, demolition began on the segment that once housed JCPenney, B. Dalton Bookseller, Old Navy, and Ruby Tuesday, among other retailers over 40 years. By the time this multifaceted, multi-year redevelopment project is complete, it will look nothing like the former mall. University Mall may be “ground zero,” as Sharpe describes it, for the changes happening in the Uptown District. But the potential being unleashed at the mall is just the beginning. “What we’ve seen in the past is that each of the anchor institutions, they’ve been doing an awful lot for 30 years, 40 years. I mean a lot of growth. We’re now tieing it together,” states the former Hillsborough County commissioner and native of Tampa. Fowler Avenue runs straight through the middle of the Uptown District. Spanning from Florida Avenue near Forest Hills to the west all the way east into Thonotosassa at U.S. 301, the eight-lane corridor is a pipeline not just for commuters but also for commerce. 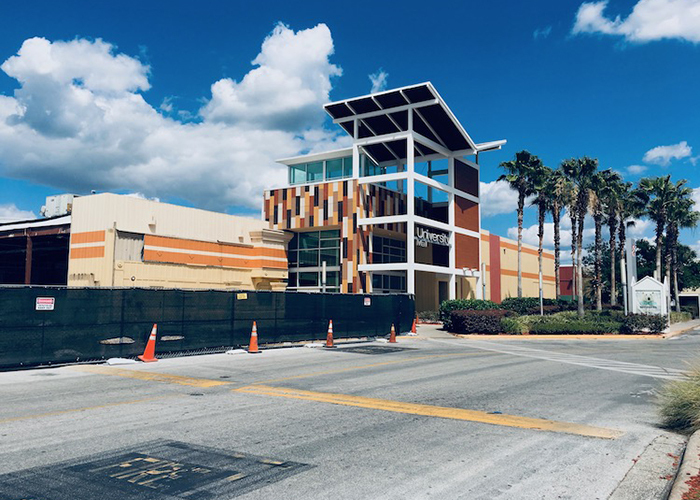 Like University Mall, businesses along Fowler Avenue -- named for a Temple Terrace pioneer family -- are undergoing major changes. New restaurants, medical facilities, and retail outfits are either renovating existing facilities or building new locations along Fowler Avenue at a pace not seen in two decades. Meanwhile, the leadership at !p and the Florida Department of Transportation (FDOT) are teaming up to reduce traffic congestion, increase mobility for pedestrians, and enhance access and safety along the corridor for all commuters. One way the partners involved with the North Tampa redevelopment efforts would like to enhance Fowler Avenue is to mark it as a real gateway corridor into the innovation district. He also sees similar enhancements along Bruce B. Downs Boulevard. “So, we’d have an east-west corridor [Fowler Avenue] and a north-south, and that, of course, is very important to us because we have Advent Health, the VA hospital, USF, and the mall redevelopment all sitting right along Bruce B. Downs.” In addition to under-bridge LED lighting at the major interstate overpasses along Fowler Avenue is improved pedestrian lighting and enhanced crosswalks. A big step in making roads safer for motorists, pedestrians, and cyclists is to reduce congestion, a problem for major thoroughfares such as Fowler Avenue and Bruce B. Downs. One solution to easing the traffic is the implementation of a circulator transit system that takes people around the innovation district without them having to rely on personal motor vehicles. 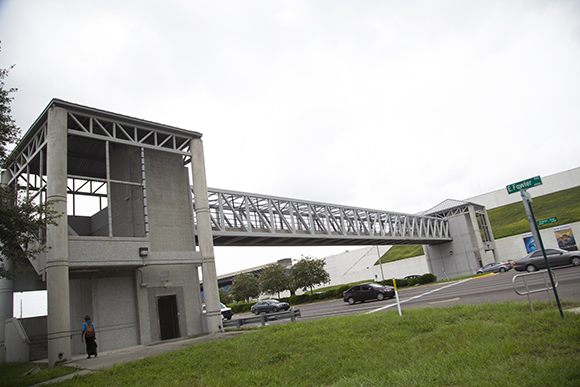 The pedestrian bridge over Fowler Ave., connects USF and MOSI.FDOT Metropolitan Planning Administrator Stephen Benson says that while efforts are underway to ease traffic and make motorist and pedestrian safety improvements throughout the Uptown District, the enhancements will primarily be seen along Fowler Avenue. He says years of studies, both of Fowler Avenue itself as well as traffic patterns along the corridor by motorists, cyclists, and pedestrians, has led to the creation of an intermodal transit plan that is being incorporated in the context of a regional plan. 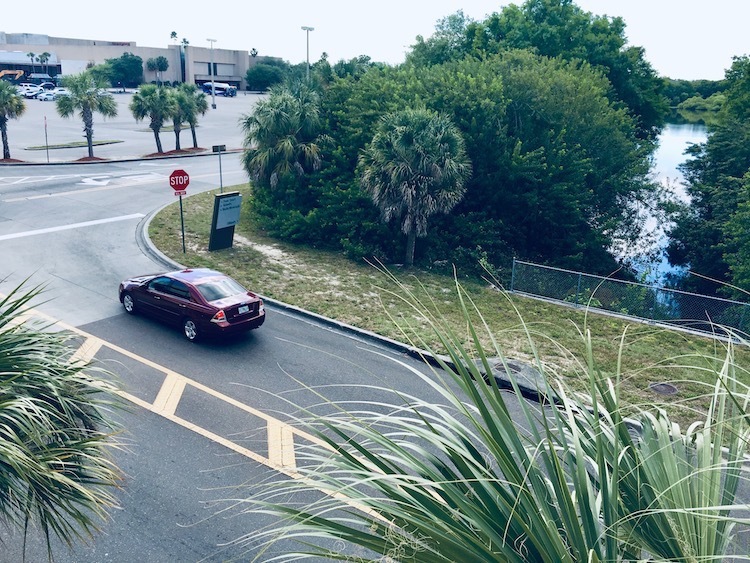 Enhancements such as crosswalks outfitted with overhead traffic signals are one pedestrian-safety component seen along other major Tampa arteries such as Hillsborough Avenue, but Benson says the solutions coming to Fowler Avenue go beyond that. “A lot of folks in the USF area think the pedestrian problems along Fowler Avenue are a tougher nut to crack. It’s a heavily congested eight-lane road, and we need to look beyond short-term fixes.” Among the many safety enhancements made to Fowler Avenue in the past couple years include new bicycle lanes and the installation of adaptive “smart” traffic signals that can sense vehicles at certain spots and adjust cycles. RD Management LLC bought University Mall in 2014 and in short order secured upscale dine-in movie theater Studio Movie Grill and more recently oversaw the development of new restaurants Portillo’s and Miller’s Ale House, as well as Race Trac gas station. Christopher M. Bowen, RD Management Chief Development Strategist, is guiding the mall's transformation. Among the changes is an 80-foot-wide swath that was recently mowed through the mall’s west wing, disconnecting the former JCPenney building from the rest of the mall structure. Uptown Tampa retail and office space renderings.The new promenade will connect various parts of the new development, including the Studio Movie Grill, multi-story apartment building, a lakefront walkway, the property’s existing 1,539-car garage, and the former JCPenney department store, which will be converted into a new 160,000-square-foot Class A office building. Demolition of the mall’s western corridor marks just the beginning of the property’s redevelopment. He sees an abundance of opportunities for the 18-acre site running from Fowler Avenue to the south along Club Drive to the lakes dividing the mall from the VA hospital campus. Approximately 50% to 70% of the mall structure's existing 1,300,000 square feet will remain when the Uptown development is fully realized. He further adds there may be demolition of a less-valuable, single-story space to accommodate new, multi-story, mixed-use development. With the project expected to span a decade, the scope of the redevelopment is all but certain to evolve along the way. He says the more than 100 shops, technology players, entertainment venues, and community organizations already in existence at the mall property provide a vibrant spirit and soul to the site. 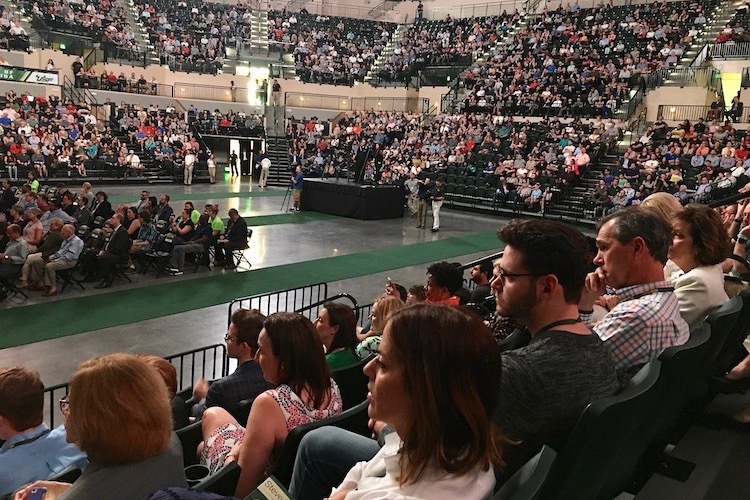 Among the 7.2-million square feet of development capacity at the University Mall redevelopment site is the opportunity to introduce something the North Tampa community currently lacks: parkland. Plans call for better use of hidden lakes behind University Mall.The two lakes on the northern edge of the mall property, already envisioned as the picturesque backdrop for possible new housing or hotel opportunities, are also central to plans for new parkland in the Uptown district. The lakes, connected underground, are part of Hillsborough County’s stormwater management system for the surrounding area. The greenway trails will allow for greater pedestrian and cyclist use and may also see the construction of a parallel shuttle way along the back lake on the east side of the property to connect the VA hospital to the Uptown redevelopment. Just to the northeast of University Mall, James A. Haley Veterans’ Hospital is undergoing some major overhauls of its own. The facility, opened in 1972, is being expanded with a new bed tower. 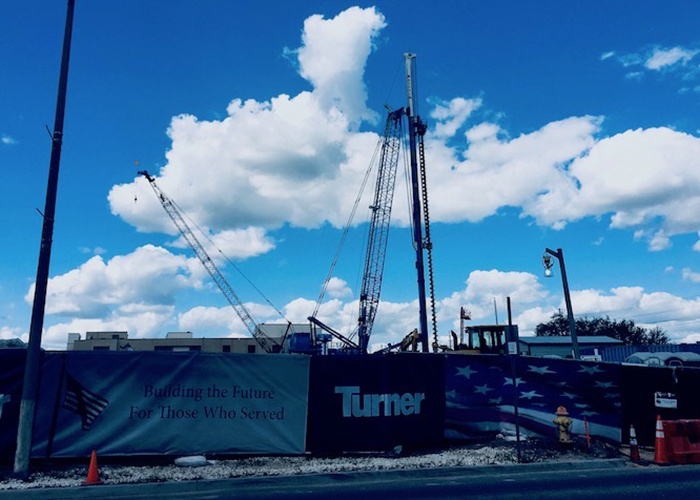 The project, the first of its kind in which the VA is partnering with the U.S. Army Corps of Engineers, broke ground on July 31, 2018, and should be completed in time for the hospital’s 50th anniversary in 2022. VA Hospital construction in Uptown District of Tampa.The new tower is being built by Turner Construction adjacent to the Community Living Center (Haley’s Cove) and is slated to include five floors with 96 medical-surgical single-patient rooms, 40 intensive care unit beds, a canteen and outdoor dining area, healing gardens, and other supported spaces. Meanwhile, the pedestrian bridge between the VA hospital and USF was partially demolished to accommodate the construction of the new bed tower and will be reconfigured to offer a new connection point to the addition and a continuous passageway to through the tower to the main hospital building. Other work at the VA hospital includes renovations to Floor 5 West of the main hospital that decompressed four-patient bedrooms to two-patient bedrooms and created 14 single-patient private rooms on the medical-surgical unit. Upcoming projects include construction of the Juliet parking lot off of 131st Avenue for hospital employees and University Mall park-and-shuttle to alleviate traffic on the campus and improve traffic safety by creatively using existing space around the hospital. An expanded specialty services facility will add 13,800 square feet for two additional interventional radiology suites and a wound care center expected to open in 2020. All of the projects mean improved services for local veterans and more employment opportunities in the Uptown District. 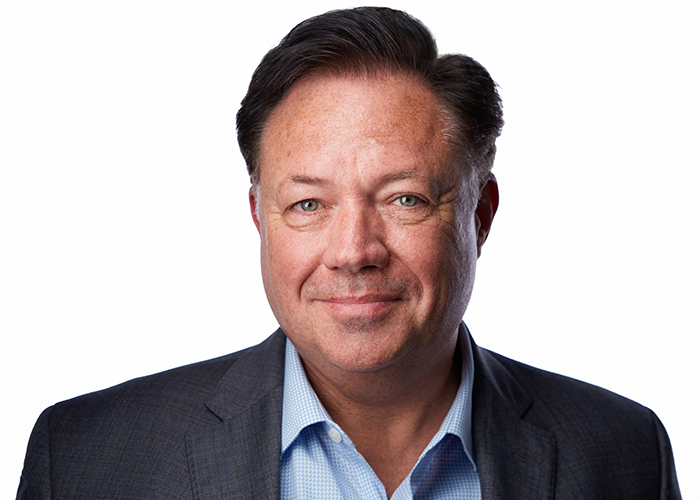 Hospital Director Joe Battle is on the !p Leadership Board and is working on some of the projects designed to beautify the Uptown District, including the greenway project connecting the hospital and the University Mall redevelopment site. Moffitt Cancer Center has been in virtually continual expansion since opening its doors off Magnolia Drive on the USF campus in 1986. 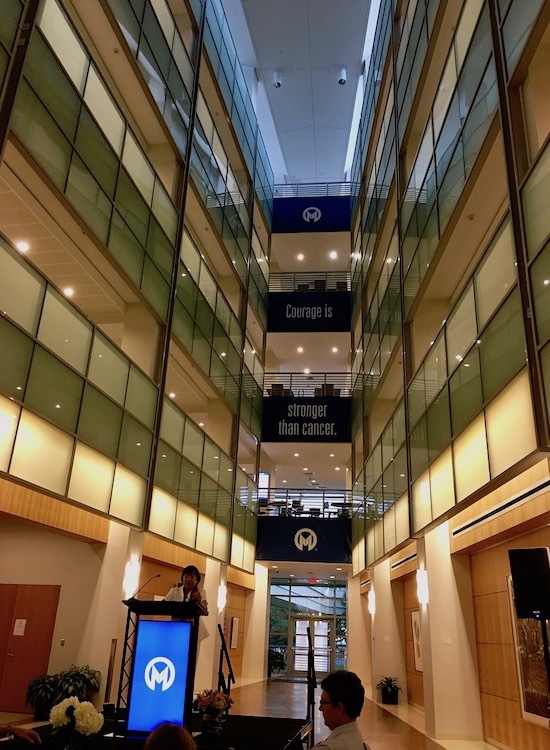 Designated by the National Cancer Institute as the only Comprehensive Cancer Center based in Florida, Moffitt has undergone several expansions in the 1990s and 2000s; the original facility is now essentially landlocked and can only grow upward. To help better serve populations spread throughout the Tampa Bay Area, Moffitt has also built satellite locations elsewhere around the region. Among these newer facilities located off the USF campus is a complex just south the USF campus on McKinley Drive that opened in 2007 and became one of the catalysts for the growth of the medical corridor now at the core of the long-range plans for the Uptown District. Inside the Stabile Research Institute at Moffitt Cancer Center.“The building that opened in 2007 was originally designed for M2Gen,” says Moffitt Chief Operating Officer Jack Kolosky of Moffitt Genetics Corporation, the hospital’s for-profit health informatics solutions subsidiary focused on the discovery, development, and delivery of genetic and molecular profiling technology also known as precision medicine. The mission at the expansive complex on McKinley Drive between Busch Gardens and USF is to help develop genetic-based treatments for specific patients. “It is still going very well,” Kolosky says. The complex on McKinley is also home to Moffitt Cancer Center’s Richard M. Schulze Family Foundation Outpatient Center, a unique facility that opened in 2015 and is providing a variety of oncological services. Meanwhile, cranes rise high above the original Moffitt facility on the USF campus. The construction led by Gresham Smith at the Moffitt campus at USF is for a new eight-story clinical support building. “It’s substantial and is designed for faculty and labs,” Kolosky says of the 200,000-square-foot building expected to be complete in early 2020. What's ahead for Moffitt? “We are looking at what our bed needs are,” Kolosky hints. Indeed, accommodating more people is necessary in a place such as the Uptown District, much of which is built on the precept of serving up the latest in science and technology to the masses. Background: The retail hub, formerly known as University Square Mall, opened on August 15, 1974, and for some two decades served as a premier suburban mall before several anchors and other major tenants either moved away to farther-flung shopping centers or suffered significant financial hardships at the corporate level. University Mall underwent massive renovations in the mid 1990s and saw a significant facelift in 2008, yet neither project helped to recapture the booming crowds of shoppers or the gleaming portfolio of A-list tenants once seen at University Mall in the 1970s and ‘80s. The new tower is being built adjacent to the Community Living Center (Haley’s Cove) and is slated to include five floors with 96 medical-surgical single-patient rooms, 40 intensive care unit beds, a canteen and outdoor dining area, healing gardens, and other supported spaces. Meanwhile, the pedestrian bridge between the VA hospital and USF was partially demolished to accommodate the construction of the new bed tower and will be reconfigured to offer a new connection point to the addition and a continuous passageway to through the tower to the main hospital building. “The building that opened in 2007 was originally designed for M2Gen,” says Moffitt Chief Operating Officer Jack Kolosky of Moffitt Genetics Corporation, the hospital’s for-profit health informatics solutions subsidiary focused on the discovery, development, and delivery of genetic and molecular profiling technology also known as precision medicine. The mission at the expansive complex on McKinley Drive between Busch Gardens and USF is to help develop genetic-based treatments for specific patients. “It is still going very well,” Kolosky says.